← A New Holiday Is Going Down the Drain! After a busy and enjoyable Sunday at the Ringroad Church of Christ, our group headed out that evening crammed into a couple of hired matatus, one more time braving the Kisumu traffic in search of sustenance for our hungry horde of travelers. If you’re wondering what exactly a matatu is, then you’ve never been to Kenya. In short, it’s a minivan designed for about 11 passengers, and it is a prime means of transport in and between Kenyan cities unless you want to ride a motorcycle or bicycle–a piki-piki–or risk a tuk-tuk, which is a three-wheeled motorized taxi. Or you can walk, which has its own complete set of inherent dangers. (While I will get into the wonderful world of Kenyan transportation in another blog, I will only say here that it is rare to see a matatu with 11 passengers; twice that is more the norm! There also seems no “end of useful service life” for these vehicles. The ones we rode that night had worn out about the time Paul was writing his epistles.) We ate al fresco that evening at a restaurant owned by a Muslim family. The fare was fried chicken, vegetable platters we’d been assured by our team leaders would kill us if we ate them, along with an appetizer of some sort of Arabian delicacy made from curdled barbecued milk that looks and pretty much tastes like white rubber. It was every bit that good, and I passed on seconds. If I had to eat much of that stuff I might consider martyrdom! We survived the road trip back in our rattle-trap matatus, and then after a second night spent in the “Hobbit” room of St. Anna’s Guest House in Kisumu, the sun rises–not that long after it has set back home–and Monday finds us heading back into the slums of Nyalenda where at the Ring Road Orphan’s Day School VBS is the order of the day, our first Monday in Africa. It’s ironic to be in Kenya on the first day of VBS as in about 8 hours, VBS will also be starting at my church back home. (I love VBS, and having been a children’s pastor in my earlier years, I have organized and run a bunch of them. I have a wonderful staff now that includes Billy Kersh, the KING of VBS, who is able to handle such things with ease. That said, there is a level of chaos that comes with it, and I have been tempted on occasion to put the “vacation” back into Vacation Bible School! It would seem that God has other plans, and even though I am most of 10,000 miles away from home, it’s Monday, and I’m at….VBS!) As we approach the school, things are already underway. I’m not directly involved; no one here knows that I am a former children’s pastor, and I haven’t volunteered that information! I’m really just watching today, which is a good thing for pastors to do sometimes, and I note quickly that there are some universal truths about VBS no matter where it’s happening. There is a degree of chaos, but it quickly moves toward order as the women take charge. It is impossible to do VBS anywhere without women; they are a force to be reckoned with, and the troop of ladies who have come with us are no exception. They have a plan, and it will be implemented. There are a few guys helping out, but we know our roles; the women are the masters of the situation! Also universal is the excitement in the air. The children are so happy, so eager for this day and its joy. And, most importantly, they will learn Bible stories of this Jesus who was once himself a child and who grew up not really that far away from here, and who probably looked somewhat more like them than he did me. Jesus is the star of VBS, and that is how it should be. The day’s activities fortunately allow me to reconnect with some of the kids I met yesterday at church services here. They are all in school uniforms today, white trousers or jumpers with light blue shirts. I must confess I have trouble telling them apart. But that is OK… they find me, quickly enough! Pheline Dkinyi is determined to teach me Swahili; she presents me with a hand-written Swahili-to-English guide that might make me a kindergartner if I could learn even that much. Her notes are addressed to “Jacob”—which is the close biblical equivalent to James. “Jim” is not in their vocabulary at all. The notes are signed formally, “your faithful child.” Pheline wants to know much about my world, and my family. I learn she wants to be a lawyer; Pheline’s ability to question will serve her well! Emmaculate Atieno is her friend; they are joined at the hip, a classic teenage symbiosis. She wants to be an artist, and her note is adorned with swirly line drawings. She asks if I will bring some markers for her when I return. She speaks that last part as if it will be fact; even though I have only been here for less than two days now, I feel reasonably certain that I will see her again, that somehow I must. Africa does that to you, I’m told. A young man I met the day before finds me as well. His name is Evans; I called him Vanderbuilt yesterday because he had a sweatshirt with “Vanderbuilt”—as in the university—emblazoned across the chest. He didn’t get it; my humor doesn’t translate so well here. Evan is a talker. He is tall and thin, soft-spoken, with intense eyes that seem to pierce the depths of my heart. As I strain to hear him, he tells me of his older sister Diana, and of a younger sister who is in the hospital in Nairobi. It sounds serious enough, and the look on his young face coupled with the weight on his narrow shoulders tells me that it is serious, and he knows it. Still, I get $750,000.00 worth of his million-dollar smile from time to time. He is clingy, doesn’t want to leave when the bell rings signaling that break time is over. And I wish he didn’t have to. I don’t know why Evan found me, but I’m glad he did. 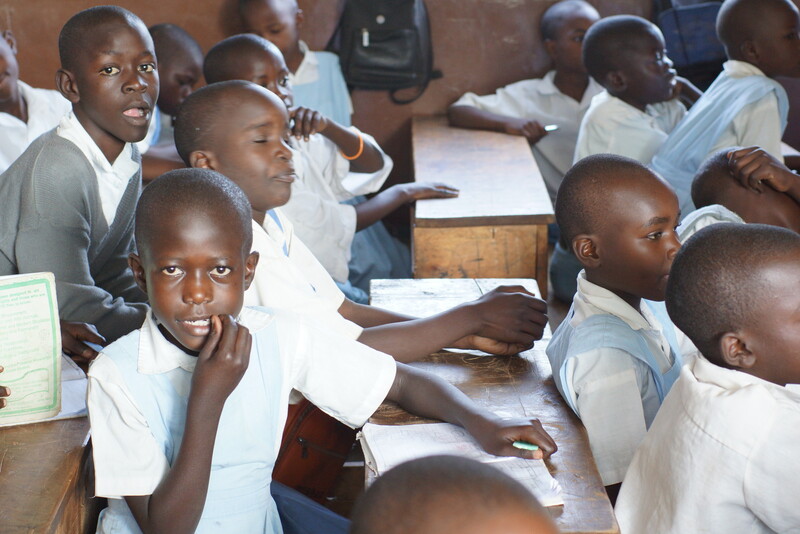 These kids are but three of Kenya’s 2.5 million orphans. These are some of the more fortunate ones. Several of us will be leaving soon after lunch, heading northward. We begin saying our good-byes, severing friendships that are much too young. As I look out over the sea of beautiful faces here at the Ring Road VBS, I am given to wonder a bit. I’m an outsider, most definitely, just a visitor in their world. I can’t imagine their lives, and I can’t help for a moment contrasting them with the lives of my own children, born into comparative privilege, and even now into their 20’s well-loved, protected, nurtured and sheltered still more than they realize. I have great kids, and they are grateful and appropriately thankful for what they have. But like their peers–and to a great extent like their parents—we are all somewhat oblivious to the material blessings and opportunities that we might mistakenly assume are our birthright. This experience is wreaking havoc with my concept of blessing, for these Kenyans I’ve seen and come to know so far, adults and children alike, have a joy that flows easily–completely in spite of their apparent poverty. I don’t see much of that kind of joy in America, even among believers. We have everything, but seem tired and worn and anxious, a nation that leads the world in stress-related diseases. They have literally nothing; perhaps it is in the emptiness of their circumstance it is easier for them to know just how good it is to have found a friend in Jesus. We sometimes sing, “He’s everything to me.” They live it. Every single day. Maybe, just maybe, they are more blessed than we—for they can see it in the clarity that comes with a truly unencumbered, uncluttered life. I’ll have to think about this some more. I’m glad for these hundreds of kids that caring and generous sponsors from America are truly allowing some basic material provisions to flow into their lives. And I’m glad that these three I’ve come to know just a little bit have found a loving environment at this orphan school where they are fed, clothed, educated, and bathed in a daily dose of both practical and proclaimed gospel Christianity. Seeing them gives me hope for their future. The old saying goes like this: “If you give a man a fish he will eat for a day; if you teach him how to fish he will eat every day.” Here at VBS and every day at this school they are being taught about Jesus, and that is teaching them how to fish. It’s not that they can survive and excel simply by bettering themselves. It’s that as they come to know Jesus the Fisher of men–they cannot help but be changed, and then become agents of change themselves. That’s the way the gospel works. After a quick tour of a neighboring high school called “Oasis” the morning at Ring Road ends with lunch; we eat a bowl of rice with goulash, a much more substantive meal than the beans and rice they fed the kids, and I can’t help but feel a little bit guilty. We begin the walk of twenty minutes back through the slums, dodging sewage and chickens and motorcycles and bicycles—threading our way against the current of human hopelessness. We emerge on the other side, stepping across the highway as into daylight from the shadows. We cross the road, and make our way back to the sanctuary of our walled-in, guarded, gated guest house—a world of clean sheets, hot water, maid service, breakfast—everything you could need or want. It doesn’t do any good for Evan or Emmaculate or Pheline to want it. They will perhaps never have it, unless, God-willing, they can be some of those fortunate few who are afforded opportunities that will get them out of the slum. They have a tough climb ahead, but I see hope even in the dark corners of Nyalenda. It’s time to pack up and load up for the road trip to Bungoma, north of the Equator. It will be my first serious roadtrip in Africa; the unknown beckons and there is still so much to see and do. But these are stories are for another page.